Kawasaki Versys Forum > Kawasaki Versys 650 Motorcycle Talk > General Discussions - V-650 > How to Post inline Pictures into Threads - no Photobucket! How to Post inline Pictures into Threads - no Photobucket! This enables many of the blocked photos by loading this in your extensions!! Most forums have the ability to attach pictures to your thread as attachments - but this is a poor way to express yourself when doing a nice blog or how to article. It just does not flow and your pictures are clumped at the end of the post. With most forums we can embed image url's using the BBcode 'IMG' tag. 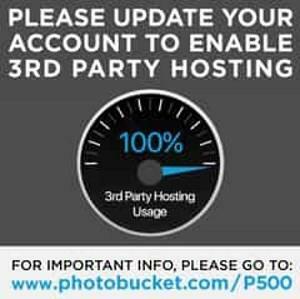 Photobucket was great as it allow you to embed your pics with these tags... but now all you get is a ransom image to upgrade to their US$400/yr service! Well it just happens that most forums also have a Gallery or Album area for members. This thread is created using the build in Album of this forum. On KawasakiVersysForum You can create Albums under your account area by clicking "UserCP", then on the left Navigation area under Networking you will see "Pictures and Albums"
Clicking on "Pictures and Albums" you can then create "New Album" or edit ones you already created. So click on "New Album", and give it a relevant Title and if you want a description. Set the Album Type to "Public" so you can post the pictures in threads. Here is your empty Album. Click "Upload Pictures"
I changed nothing and clicked "Save Changes" button, which takes you to your Album and shows you picture thumbnails. It is is probably best to open your Album in another window. That way you have 2 windows open side by side and can type a post in one and look at your Album pictures in the other window. So you want to paste a picture now in the middle of your post - this is called posting inline pictures - just as I'm doing for this how-to. Goto your Album window then click on the thumbnail picture you want to put in your post. You are now viewing the full size picture and below it is the all important "BB code". Each album can contain 60 images... need more pictures on album topic make an album topic #2. This is NOT a image backup service. Images uploaded are not the original and quality and size might be constrained. Make sure you back up your images appropriately! Please do not abuse this Album feature. If the forum Albums are being abused there will be action by Moderators. Does the gallery always auto-rotate pictures so that they are in a wide aspect ratio? Any way to rotate the pictures once uploaded? Practice doesn't make perfect, it makes permanent. If you are talking the order in the album, yes. There is a edit pictures First create a new album and save, next edit pictures in your existing album, you then check box what pictures you want moved and check box in the order you want them moved, that is , if picture 3 you want first , move that one first. Last edited by onewizard; 06-02-2018 at 11:38 AM.